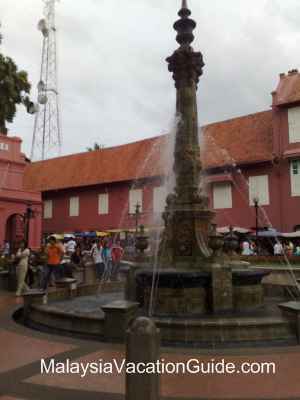 When the Dutch took over Melaka from the hand of the Portuguese, they built several buildings for their own purposes. 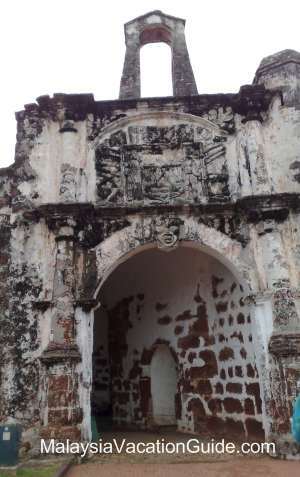 This church was built as a place of worship as they did not have any church for themselves apart from the small chapel built by Portuguese on St. Paul Hill. 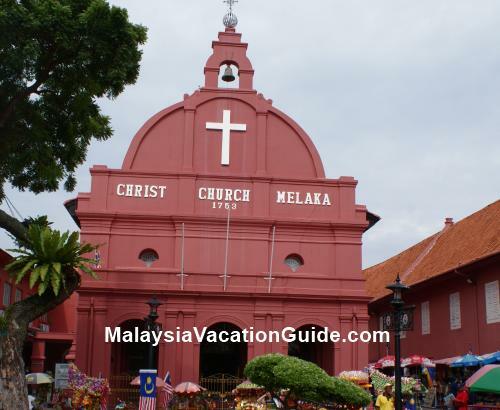 Like St. Paul Church, this church is one of the most attractive heritage in Melaka that has gone through several stages of change under the governing of different colonials. 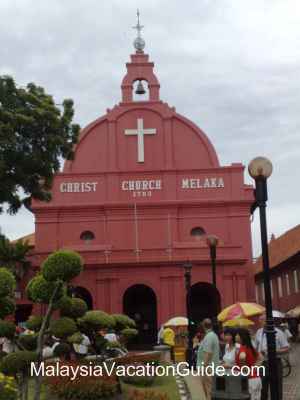 The church still attracts many visitors especially if they are visiting Melaka for the very first time. 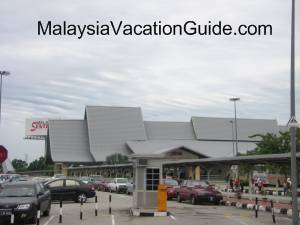 Located at Jalan Gereja (or known as Church Street! ), the church is painted in coral red with huge white cross at the middle. It is the most distinguished one among adjacent buildings that are also painted in similar red colour. Surrounded by beautiful landscape with greenery and flowers, you will probably feel like visiting a vintage church somewhere in Europe! 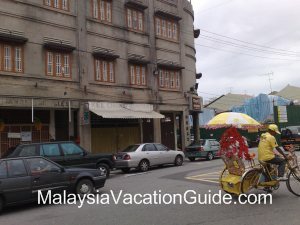 However, there is something unique and unusual that you might not be able to get in Europe but only in Melaka – the colourful decorated trishaw! In front of the church, there will always be striking trishaws lining up, offering the service to tour you around the town. The existence of trishaw makes the church’s surrounding area more lively and outstanding! 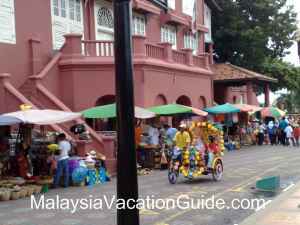 The many colourful trishaw that you can take while you are here. As mentioned, this Christ Church was built by the Dutch. They started the construction in 1741 and completed it in 1753. At that time, the church played its vital role as a place for the Dutch to pray. 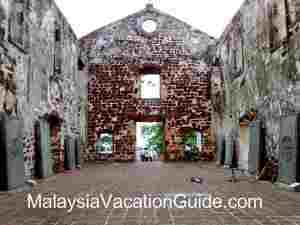 Later, when British took over Melaka for a temporary term, they converted the original Protestant church into an Anglican church. At the same time the British added the bell and weathercock on the church. You can visit the church by getting the permission of the person-in-charge because without having a look at the interior, you might not be able to recognize the magnificent construction of this building. One surprising fact with regards to the construction of Christ Church that everyone has to know is the ceiling beams. The Dutch, with their superior architecture skills, had constructed the beams of the church by using huge tree trunk with no joints between each other. Enjoy a bowl of cendol from the stall located just opposite the Queen Victoria Fountain. Besides, you will also be attracted by the Brass Bible that has a Dutch version of St. John engraved on it. While you are walking, mind you step on the floor as there are old tombstones with engraving of Armenian script integrated in. Hence, take a slower and smaller step so that you can have a closer look at the valuable and unique tombstones. “The Last Supper” – the famous painting is being presented in Christ Church in a creative way. The painting is made up of glazing and glossy tiles in different colour instead of canvas and oil paint. However, the originality of the painting is being retained where every inch of it looks exactly the same as the original. The church is located opposite to Stadthuys, the former official residence for the Dutch government. In the middle, you can see a beautiful fountain and that is the Queen Victoria Fountain built by the British. 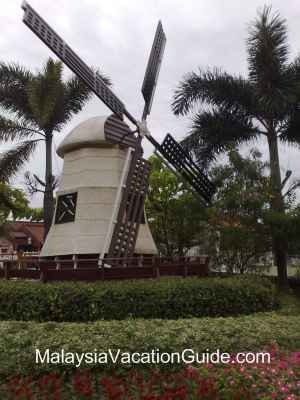 Further, there is a windmill that faces the fountain. 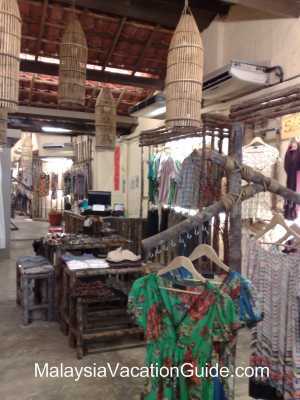 In such as small area, one can experience the art of architecture that brings you back to the olden days! The Queen Victoria Fountain that was built by the British still stands strong today. The windmill adds to the uniqueness of the church nearby. Most parts of the church were constructed manually including the pews and windows. It still stayed the same even though it had been built more than 200 years ago. Until now, the church is still functioning with services available in English, Chinese and Tamil languages. 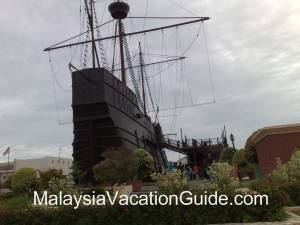 In fact, it is the oldest church that is still in operation in Malaysia – another interesting fact to know about this Church!